It was 2003, just before the dawn of social media and the resurgence of small arts + craft shows when the Shiny Fuzzy Muddy Collective was formed by a small group of emerging artists at the time. It was a collaborative effort to create events that brought their art to the people. 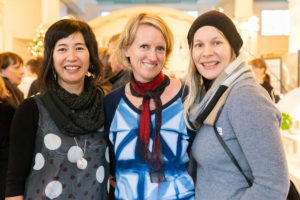 The driving force, vision and logistical magic making behind the collective has always come from it’s core members over the years, which now currently includes (L to R) Kari Woo, Frances Dickinson and Janna Hurtzig. Initially drawn to each other’s aesthetic sensibilities and integrity, they found great support and inspiration in their collaboration and so it has lived on ever since! The main mission is to present their annual Shiny Fuzzy Muddy Show, which takes place the second weekend in December at Heritage Hall in Vancouver. With an effort made to seek out new artists each year, up to thirty guests are invited to exhibit and sell their work at this historic Main Street location. The common threads that bind the works together are the high quality of design, craftsmanship and material sensibility. Created as an antidote to large-scale tradeshows and low-quality craft shows, they focus on promoting the work of mid-career professional artists along with the ‘NEW + NOW’ section that features promising new talent. With a decided lack of holiday music and kitschy decorations, patrons can be sure to find meaningful objects to enhance the quality of their lives and to meet the designer/makers directly. The unintended side effect of producing such an event annually is the community that has been created in it’s wake – a community of makers, supporters, arts advocates, entrepreneurs, aspiring creatives and so many more; relationships have been built that go beyond the event itself. SFM provides the stage for quality makers to meet their audience and attract patrons that can understand and appreciate the intent and value of the work presented. They are proud of the many artists they have been able to support over the years by helping to promote and sustain their creative work, and the work they’ve done to foster the ‘buy local’ and ‘handmade’ movements.